Universal Foldable Keyboard is the wireless ultra-thin, spill-resistant, compact keyboard with 76 thin chicklet keys plus 10 functional keys. The latter includes: Play/Pause, Volume up, Volume down, Mute, Previous Track \ Next Track. The keyboard also has a Home key and such keys as Device 1, Device 2, Lock, Search. The connector’s interface is Bluetooth 4.0. The keyboard can be paired with up to 2 devices, including the wearables: iPhone, iPad, Windows phone, Android phone or tablet. Device 1 \ 2 keys help to toggle between the paired devices with a single touch. Universal Foldable Keyboard features the water proof keyset and fabric, a folding hinge in a middle and two magnets, so the closed keyboard won’t flap around. Due to its design the keyboard has two blank space keys. There’s no Windows key but the Home hot key functions as such under Windows OS (it works as Home key under iOS and Android). The keyboard runs on the rechargeable lithium battery with typical life of 3 months on one charge. The USB charging connector is placed in the right ridge of the keyboard. 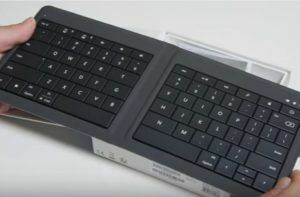 Product name: Microsoft Universal Foldable Keyboard. Keyboard Name: Microsoft Wired Keyboard 600. Pairing limit: up to 2 devices. Full compatibility: Microsoft Windows® 10 / 8.1 / 8 or Windows Phone 10 / 8.1 Update 2. Limited compatibility: Apple iOS 8 – iOS 9.1, Android 4.4.2-5.0. Compatibility logos: Designed for Microsoft Windows tablets, iPad, and iPhone. Microsoft Windows PC and Phone top system requirements: Microsoft Windows 10 / 8.1 / 8 or Windows Phone 10 / 8.1 Update 2, Bluetooth HID (Human Interface Device) keyboard support, 60 MB of free disk space, USB socket. Macintosh PC top system requirements: Apple iOS 8 – iOS 9.1, Bluetooth® HID (Human Interface Device) keyboard support, 30 MB of free disk space, USB socket. Android top system requirements: Android 4.4.2-5.0, Bluetooth HID (Human Interface Device) keyboard support. Hot keys: Device 1, Device 2, Lock, Search. Media keys: Mute, Volume +, Volume -, Play/Pause, Previous Track, and Next Track. Hot Keys life: 500,000 actuations per key. Dimensions (open): 9.53 x 4.29 x 0.47 inches. Dimensions ((closed): 5.75 x 4.29 x 0.94 inches. Battery: Lithium rechargeable battery 3.7V 165mAh (min.). Recharging: USB charging cable, included. Universal Foldable Keyboard lacks the numeric pad as well as Caps Lock LED indicator. But there’s a white “ON” indicator in the left top corner. The keyboard automatically turns on when opened and turns off when closed. The battery is soldered, the whole keyboard is solid, manufactured of a soft fabric. On one hand, it makes the keyboard spill-resistant, on the other hand, the keyboard life depends on the battery life. When the battery dies, the keyboard is beyond repair. The keyboard is folded with the keys in and is kept in place with two magnets. It goes with a single USB charging cable, rather short one. The cable doesn’t support data transfer, you can’t plug the keyboard in and work. The wireless range is about 33 feet but no object, especially a metal one should interfere between the keyboard and the receiver. The keyboard takes some time to get used to because of a split in the middle. As the keyboard is designed for touch screen wearables, it lacks the touchpad and using it with a PC can be problematic. Hot keys functions vary under different OS. Thus, F1-F12 keys and Del behavior under Windows is similar to that of the conventional keyboard with the “Fn” key pressed. Under iOS and Android F1-F12 keys cannot function at all. As there’re no escape commands under iOS and Android, the key acquires navigation features, while the absence of the Lock mode is made up for with the Sleep mode. Here’re the list of functions assigned to the keys under various operating systems. Home logo: Windows key function. Left Ctrl: Control key function. Lock icon: Lock Screen function. Home logo: iOS Home button function. Esc: Browser Back key function. Home logo: Android Home button function. We know you like a good deal. Here’s your chance to earn money for selling your used tablet and accessories: Sell tablet online now for top dollar cash! Video uploaded by Windows Central on July 14, 2015.